The Hub Of All Of Your Marketing"
Stop Loosing Leads...Our Real Estate Investor Websites Attract More Qualified Leads. Our fully developed websites, when combined with our complete KISS Online Marketing System, outperform all others 100:1. By themselves, they still outperform 25:1. How much money are you loosing? Real Estate Investing is your Passion, your Dream, your Livelyhood. Your business depends on leads to bring you deals. Most websites are canned, sometimes glitzy...all show and no go. They do not produce the leads you MUST have to be successful. "How Many Leads Did Your Website Produce Today?" Get your income producing website that delivers new clients! We deliver on time, no headaches or hassles. Ultimate SEO and Content-Evaluator that no one else has! And, they also look fantastic! Every job I have ever had turned into a marketing position because if you don't have customers, you don't have a business. And my previous bosses were delighted when I brought that skill-set to their table which resulted in more sales. My purchased websites failed to bring me qualified traffic to my surprise. I lost the original investment and quit paying the monthly fees and went back to the whiteboard. "Just because you build it, does NOT mean they will come." You see you have to drive traffic to your website. I will show you how. So still, I thought I needed to have the best website. So I opted to build a more modern broker website. I fell for the ultimate, glitzy Wordpress template with all the bells and whistles. I strayed from the marketing plan I had successfully developed throughout every position I have ever held. I created the most current looking website with every feature I could put in. MISTAKE! I was not getting the traffic I wanted. I failed to do the daily work that I knew needed to be done, and instead thought the glamor would boll them over and they would come just to see this work of art. I overlooked the desires of my Avatar. My writing spoke over their cardboard image instead of to their hearts. I wanted the short cut success that all these other real estate web developers were telling me they were providing. But I began to hear from other investors were were loosing money in their marketing efforts, even after spending thousands of dollars. Then, fortunately, our KISSCapital.com website was hacked and infected. The search engines dropped us and even banned our content. We were forced to completely remove the site. Rather than leave ourselves vulnerable to a future repeat of another attack, I went back to my roots, the basics, and moved our site and business to the old, now new level of stability and optimization! Once I completely rebuilt the site, I worked hard and developed and implemented the new KISS Marketing System. I spent months refining the essentials. I did tons of research and did take tidbits and new ideas from some of the real estate seminars I attended. And I realized the problem most investors faced was the lack of tools, consistency and a system that is easy to use and does not consume all of your time and money. At last, all of the pieces of the marketing puzzle had come together!!! I restarted my broker website combined with my System. And, boy did it work! KISSCapital.com showed up on the search engine radar again. And we soared like an eagle to the top! Far, far higher than we had ever been before. Over the next 10 days, we went from a US Ranking of 576,429 to 293,698 in the Alexa Rankings. Below are the screen shot images of the rankings as proof of our climb to the top. We can help you do this for your business too! Get the consistent flow of leads you need with KISS. 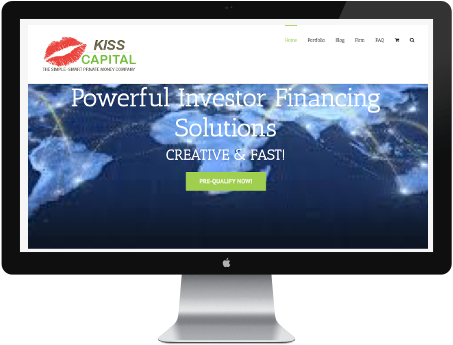 "The KISS Online Marketing System"
“There is no question that KISS gives our real estate investing business an edge over the competition! They are my secret weapon! Their expertise in lead generating websites and search engine marketing propelled our website to the top! Now our website brings us leads instead of us having to pay to send leads to it! But more importantly, those leads convert to more houses bought. Leads are great, but I also had to learn how to negotiate with the sellers to sign the deals. And KISS gave me free, weekly trainings that taught me how to do that. I'm glad I trusted KISS to deliver the results they promised.